Snowpiercer Home Entertainment Review: Balls-to-the-wall trip of a lifetime | SWITCH. For bombastic originality and unrelenting style, no film has done better this year than Joon-ho Bong’s ‘Snowpiercer’. The English-language debut for the South Korean director of ‘The Host’ (2006), it was the little science fiction epic that could, overcoming a compromised international release to become something of a cult hit. After its Australian premiere at the Sydney Film Festival, where it received more complaints than any other film in the festival, it only had a small cinema release here, so its Blu-ray release means an even wider audience will be able to discover this new sci-fi classic. After a disastrous attempt to rectify global warming, the earth has become a frozen wasteland. What is left of the human race circles the earth within a highly advanced train. Within it, class systems and discrimination still exist, and after eighteen years, those in the impoverished tail section, led by the idealistic Curtis (Chris Evans), begin to battle their way towards the engine and dismantle the hierarchy that has kept them under heel. It’s an extraordinary premise, taken from a classic French graphic novel, and in the hands of director Bong, pushed as far as it possibly can. Equal parts social commentary, black comedy, Orwellian dystopia and balls-to-the-wall action film, every moment is executed with tremendous energy and bravery. It’s no wonder that Sydney audiences were taken aback by it, the film refusing to adhere to any genre requirements or the safe conventions of Hollywood cinema. The design of the train itself is extraordinary, every minute detail being considered and realised. If the environment wasn’t believable, the film wouldn’t work at all, but the confined hell of the tail section through to the bizarre excess of the front section are extraordinary backdrops for the human drama. Director Bong also asks a lot of his cast, not only physically and emotionally but stylistically. Within the impressive ensemble you find stern naturalism mixed with flat-out absurdism, but everyone gives their complete commitment to what is asked of them. Chris Evans revels in the meaty material he’s offered, a stern and steadfast leader of a motley crew of revolutionaries. Kang-ho Song and Ah-sung Ko as father/daughter drug addicts guide the team through the train, offering a perfect counterbalance with their irreverence and playfulness. Jamie Bell, Octavia Spencer and John Hurt are also excellent, but the film really belongs to the insane Tilda Swinton, whose Yorkshire harridan Mason, in charge of keeping the political balance in the train in check, is one hell of a creation. No one understands director Bong’s style here better than Swinton, and she absolutely steals every scene she’s in. Like any great work of science fiction, not everyone will want to jump on board with ‘Snowpiercer’. Some will find its wild disregard for stylistic rules or its graphic violence off-putting, or even dismiss its premise as just plain silly. For those, however, that find their tastes in alignment with what Joon-ho Bong has to offer, this is extraordinary, nail-biting, preposterous genius. Getting a chance to revisit the film again pretty much confirms what I suspected - that come December, it will still be in my top-five best films of the year. ‘Snowpiercer’ is simply too good to forget. ‘Snowpiercer’ is simply too good to forget. Roadshow have condensed the U.S. two-disc release down to a single disc, but that doesn’t appear to have compromised the picture and sound quality. The 1080p 1.78:1 transfer isn’t perfect, betraying the budget limitations on the film, but it still looks terrific, the overwhelming level of detail in the film perfectly suited for high definition. Colour is an important element of the film, from the depressing greys of the tail section, to the sci-fi dreamscapes of the head, and these are preserved beautifully in the transfer. The DTS-HD MA 5.1 track is also excellent, capturing the careful sound design for the film for an immersive audio experience. Probably the greatest surprise with this release is that all of the features from the excellent U.S. release are carried over. It makes up an hour of material, as well as a critics commentary hosted by Scott Weinberg. Mostly short featurettes, the video material covers the casting of the film, the design and director Bong’s style, as well as a short animated prologue. The most substantial feature, ‘Transperceneige’ (the name of the graphic novel) turns out to be the least fulfilling, an ill-executed French documentary about the origins of the project that uses hyperbole so verbosely that it makes my more excitable reviews sound bland by comparison. It’s worth a look, but has the least to offer. That said, Roadshow should be applauded for carrying all this material over, giving ‘Snowpiercer’ the kind of release it deserves. The 'Snowpiercer' competition has now closed. Winners will be announced shortly. Competition opens at 6:30pm AEDT on Sunday 23rd November 2014 and closes at 11:59pm AEDT on Sunday 30th November 2014. Five winners will be chosen at random on Monday 1st December 2014. To successfully win, entrants must fulfil the above entry conditions before the time the competition closes. Current members/followers are eligible to enter the competition. Only one entry per person. Only one winner per household. To be a valid winner, the entrant must not have won a prize from SWITCH within the last 28 days. Each winner will receive one Blu-ray copy of 'Snowpiercer'. By entering, you agree to receive occasional emails from SWITCH in the future. If you decide to unsubscribe from these updates, any further entries will not be applicable. Only Australian residents are eligible to enter. 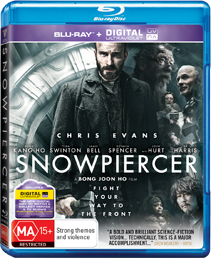 'Snowpiercer' is available on Blu-ray, Digital Download and DVD on Wednesday the 26th November 2014 from Roadshow.